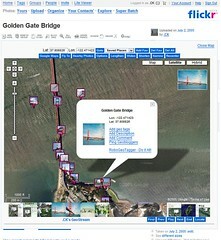 This is an easy way to see your geotagged photos on Gmap without leaving flickr. Just install the greasemonkey script to your firefox and see your photos shown on map right away. There will be a button added at the right-most of button bar if the photo is geotagged. Click the button to open and close the map. The new version of GMiF 4.0 is powered by Google Maps API 2.0. It provides more detailed satellite images, Europe maps, many new features, and more stable performance. This is a standalone web application. You can see your geotagged flickr photos by GMiF without entering Flickr. I am devoted to web programming for personal interests and run all services at home via DSL connection. If you like my work, you can donate to help the bills.